If you have tough pain like headaches, back pain, muscle pain and other body pains, Advil Liqui-Gels relieve pain faster and better than other OTC pain relievers. The medicine in Advil has been trusted by doctors for over 30 years. Nothing’s been proven to work faster to relieve tough pain. 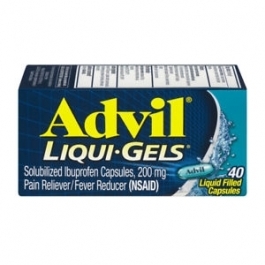 Advil Liqui-Gels were designed for fast absorption, fast relief and hours of long-lasting pain relief. ER doctors rely on the medicine in Advil for their own aches and pains. Do not take more than directed. The smallest effective dose should be used. Read and keep carton for complete warnings and information.